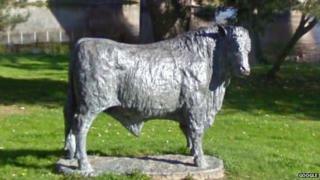 Vandals have ripped the tail off a life-sized bronze statue of a bull in Builth Wells. The damage happened some time during the evening of 21 July. Builth Wells Town Council owns the statue, which is located in The Groe. The tail has since been recovered but police are appealing for help about how the damage was caused. Anyone with information is asked to contact Dyfed-Powys Police on 101. The bull statue has been on the riverside park since 2005, when it was donated to the town by local sculptor, Gavin Fifield. The town has a long association with cattle, even in its name which is said to stem from an Anglicisation of the Welsh Buallt - which roughly translates as ox pasture.